Cruzeiro eye Tottenham midfielder Paulinho Tottenham Hotspurs midfielder Paulinho is set to move next month as Brazilian side Cruizero are taking interest in him. 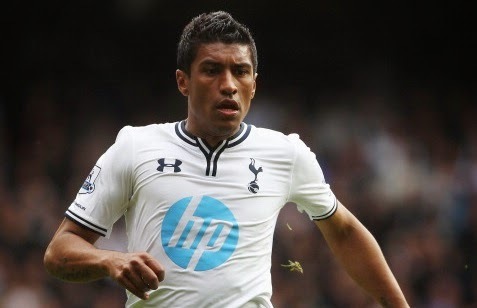 Tottenham Hotspurs midfielder Paulinho is set to move next month as Brazilian side Cruizero are taking interest in him. Cruizero sporting director Alexandre Mattos is keen to land the Brazilian star as he is struggling at the Premier League club. The 26-year-old has not been preferred by new Spurs boss Mauricio Pochettino. He has made five Premier League appearances this season but is yet to start his first League game. Cruzeiro sporting director thinks that Paulinho will be ready to return to homeland rather than wasting his time in London. The former Corinthians midfielder was signed last year by Spurs for a reported fee of £25million. He played 30 games in the Premier League last season but is yet to find a positive response from the boss Pochettino this term. Mattos told Radio Itatiaia that Tottenham have not replied yet but he is confident that it would be easy to land Paulinho as the player is eying first team football. Meanwhile, reports have also linked the Brazilian with the Serie A side Inter Milan as the former Manchester City boss Roberto Mancini is keen to sign him. The Italian outfit are hoping for a loan move with an option to buy him for £12million after the season.